You often come across websites where you don't have free access to all the sections: to be able to view the contents in certain parts of the website you need to register and obtain access credentials to enter these restricted areas. A classic example is a company site, where access to the Members' Area is reserved for salespeople and partners to view documents and price lists, or portals that require registration to access contents that can be downloaded. 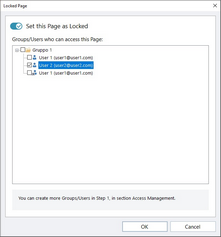 WebSite X5 offers the possibility to create a Members' Area in your website with a number of Locked pages, and access to them is granted to administrator and user groups. As you can see, Member 1 is part of the Central Coordination team and is also a member of each project committee. Consider also that, in addition to the sections on each project, the association's website also includes a number of pages containing reference material that visitors can only consult after they have registered on the website. If you are using the Pro edition of WebSite X5, the best way to handle access to the website is for the website author to manually create the users in the central coordination team and in each committee (because these users are known and in a limited number) and, at the same time, allow interested visitors to register themselves directly online. You have to first create the website Map and add contents to the various pages before you can define a Members' Area and manage the profiles of the users who will have access to Locked pages. On the basis of the organization chart above, we need to manually create nine users with access credentials, and organize them into groups. ▪ In Step 1 - Website Settings | Advanced, click on Access Management. 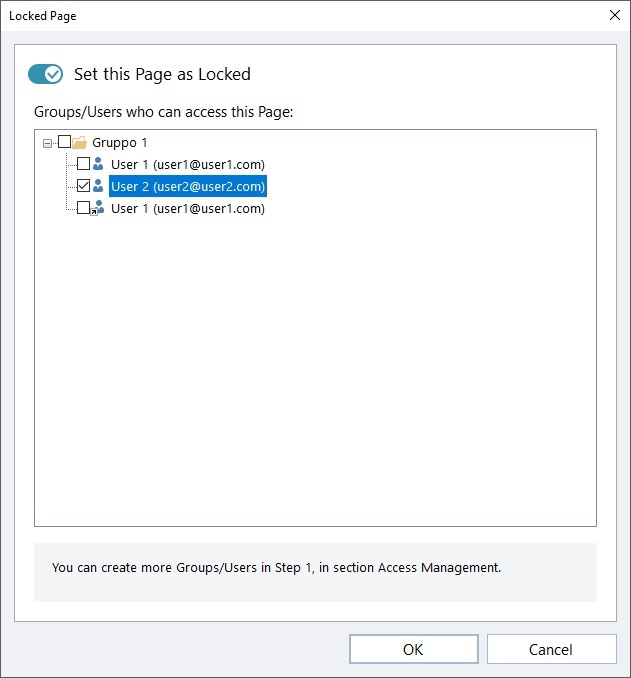 ▪ In the Groups and Users with priority access table, the Administrator group, with an Admin user, and the User group, with a User1 user, already exist by default. Select the User group and use the New Group command to create the groups that will be named "Central Coordination team", "Project A committee", "Project B committee" and "Project C committee". ▪ Select the "Central Coordination team" group and click on the New User button to open the New User window, where you can create the "Member 1" user. Type in Surname, Name and E-mail in the appropriate fields and give it a Password. ▪ Repeat this procedure to create usernames for all the members, and position them in the correct groups. ▪ The "Member 1" user belongs to all the groups: in this case, select him and click 3 times on the Create Alias command to create 3 aliases for this user. Select each alias and drag&drop it in each group. ▪ In Step 1 - Website Settings | Advanced, click on Data Management. ▪ Click on the Add... button to open the Database Settings window and enter the necessary information for setting up the database you intend using for access management. ▪ In the Access Management window, go to the Settings section. ▪ Select Automatic Registration as the Registration Mode. ▪ In the Settings section, select the Database to be used and enter the name of the Table Name where the data will be saved. You also have to specify an active e-mail address in the Admin e-mail address option: requests from users who have forgotten their password and/or new registration alerts will be sent to this address. ▪ If you want, you can also enable the appropriate options so that the administrator receives a message each time a new user registers (Send an e-mail to notify new users subscription), the "Captcha" anti-spam filter is added to the bottom of the registration form (Enable 'Captcha' anti-spam filter) and an e-mail address validation request is generated (Enable E-mail Address Validation). When you have defined the list of users, with their relative credentials, you can specify which pages in the website are to be locked, and who has access to them. ▪ In Step 3 - Map select the first of the pages to be locked and click on the button to open the Locked Page window. ▪ Select the Set this Page as Locked option and then tick each user or group who can access it. Locked pages are indicated on the website Map by the icon. Locked pages may or may not be displayed in menus, according to whether you select the Hidden option or not. ▪ Repeat this procedure for all the pages you want to lock, deciding which users/groups to give access to for each of them. WebSite X5 lets you manage not only user profiles, but also those of the Administrators. By default, an Administrator group already exists, and it contains one Admin user. ▪ To change the name and access credentials of the Admin administrator, select the name in the Groups and Users with priority access list and click on the Edit... button to open the User Settings window. ▪ To create new administrator profiles, select the Administrator Group and click on the New User button to open the User Settings window, and add the necessary information. Unlike ordinary Users, the Administrators have access to all the Locked pages in the website. With the same credentials, they can access the online Control Panel and, if they are using the Pro edition, the WebSite X5 Manager app. The administrators can use the online Control Panel and/or the app to manage various aspects of the website, depending on the features that have been included in it. These could be, for example, website hit statistics, Blog and Comments and Ratings Object comments, user registration, orders and stock levels. If you are working with the Pro edition of WebSite X5, and Automatic Registration is set as the Registration Mode, all the data on new users who register is stored in the relative section of the online Control Panel and the WebSite X5 Manager app. ▪ Open the Access Management window in Step 1 - Website Settings | Advanced. ▪ Click on the Update the list of users who have registered online button in the Users section: the details of the users who have registered automatically on the Internet are downloaded and added to the Automatic Registration group. The users in the Automatic Registration group can be moved to any other group. Once they have been moved to a different group, these users will be treated in the same way as manually-created users: their data can be edited in the User Settings window, and you can create aliases for them. ▪ The user has not yet validated his e-mail address (if requested): his name will have a yellow dot next to it. If you believe the address is valid, you can manually validate it with the Validate button in either the User Settings window or the online Control Panel and WebSite X5 Manager app. ▪ The user has given an e-mail that has already been used by another person: his name will have a red dot next to it. One of the e-mails must be changed. After having updated the user list, with the Update the list of users who have registered online button, the operations carried out on the Users will take effect only after the website has been published online. This means, for example, that the list of downloaded users will not be removed from either the online Control Panel or the WebSite X5 Manager app until the website is republished online. When the website is published on the Internet, each time a visitor tries to display a Locked page he will be asked to enter his e-mail and password. If these parameters are entered correctly, the Locked page will be displayed. By default, visitors have five minutes to enter their username and password. After five minutes, if no username or password is entered, the request for this information is repeated. The five-minute time interval is reset each time a link to a Locked page is made. When you test your website offline, a warning message will tell you that the locked pages will be displayed without requesting access. The Members' Area will be fully operational only when the website is published on the server.